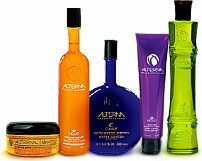 Alterna hair care product line was created for one simple purpose - to change the way people think about hair care. Born from years of intensive research and development, Alterna's goal is to continually push the alternative envelope by revealing the latest in hair care ingredients and technologies in order to shape the future of professional hair care. The end result - beautiful, healthy looking hair at any age. Alterna Caviar Anti-Aging hair care products are known to provide significant levels of this life-sustaining source and is rich in proteins, vitamins and minerals. Caviar Anti-Aging also has a cell format that is similar to human skin, helping to improve the health of the scalp. By including a caviar extract in some of its formulations, Alterna is able to bring back soft, healthy-looking luster while protecting the hair from the effects of aging. Alterna Hemp Seed is undoubtedly one of the best hair products for dry, chemically treated hair on the market today. Alterna Life Products are revolutionary hair products for fine, thinning and curly hair that controls frizz and enhance your curls. Alterna TEN products are infused with African Cacao Extract, Caviar, White Truffle Oil, Champagne Grape Seed Oil, Bulgarian Evening Primrose, and Arabian Frankincense to create products that deliver results and not promises. Alterna White Truffle hair care products are cultivated throughout European history, and this luxury blend is an invaluable source of Vitamin E, and is therefore one of the world's premier natural anti-oxidants. It moisturizes the hair and scalp while protecting the hair from damaging free radicals.